Posted by Shelley Grell on July 28th, 2014. With an election looming in New Zealand, the politicians are beginning to jockey for position, and our votes. The Auckland technology sector had its first opportunity to hear from ICT spokespeople representing the top parties at a recent political forum hosted by NZTech. Canterbury gets its turn on the 5th of August, and if the first one was anything to go by, there could be fireworks in the room. Several themes were common, with all parties heralding the great opportunity for weightless, ‘green’ exports provided by the tech industry, which was declared New Zealand’s third largest at $23 billion. They also agreed that the skills shortage was a massive issue, and each had various initiatives to address it, from education programmes to enabling and encouraging immigration. Minister Amy Adams highlighted her party’s successes, including 4G, UFB & RBI roll-outs. The yet-to-be-announced National policy on ICT would include priorities such as graduate programmes as well as new tech incubators and grants. Interestingly when Moderator Candace Kinser asked the Minister to site successful ICT government models from other countries, she pointed to Estonia and their ability to synchronise government services on a single security platform. She also indicated she would “prefer her children learn to code instead of learning French” in school. Labour representative Clare Curran focused largely on closing gaps in the digital divide in schools and initiatives to improve the school-to-work transition, such as ‘digital apprenticeships’. She acknowledged that school kids today often know more than the teachers do, but that we need to make the career paths that are available to them more obvious and attractive. Gareth Hughes touted the Green Party’s record on pushing for a second international cable and founding cross-party internet forums. He advocated for a “CTO” type role in government – a concept widely discussed in the media lately thanks to Xero founder Rod Drury. And as you would expect, the party is also focusing on building a culture and environment to attract skilled people to migrate here. The Internet Party’s Laila Harré emphasised the ICT expertise that the party’s founders bring to the table, and also heavily focused on the digital divide. Harré advocated for not just connectivity but also teacher development and classroom support until “Digicy” ranked right alongside Literacy and Numeracy as core academic subjects. She compared the need in tertiary ICT education to agriculture – for which the country successfully created a specialised, dedicated learning environment to support it: Lincoln University. Harré claimed that Technology Ministry (not just a CTO) would better harness technology within and across government to reduce duplication and eliminate waste. The most provocative comments of the night came from the floor when Rod Drury stood up and exclaimed that New Zealand has a “once in a lifetime” opportunity to create a step change in the country’s economy through ICT – and the policies and initiatives discussed by all four of the parties presented thus far were boring, merely incremental, and “don’t cut it”. He called for the government to get their act together and engage with the private sector, and received the loudest applause of the night. 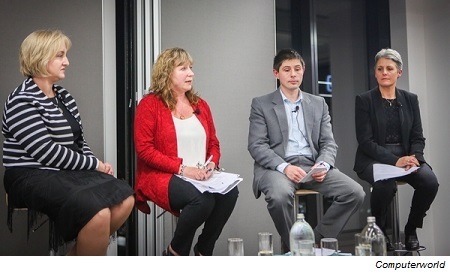 Computerworld: In pictures: NZ Tech facilitates political panel discussion on ICT issues. If you’d like your own chance to grill the politicians in person, your next chance is in Christchurch on August 5. It’s terrific to see multiple events and opportunities for the ICT industry participants across the country to have their voice heard as we all prepare to cast our votes and set the course for the next three years.